The beauty of this hat lies in the pretty color pattern. 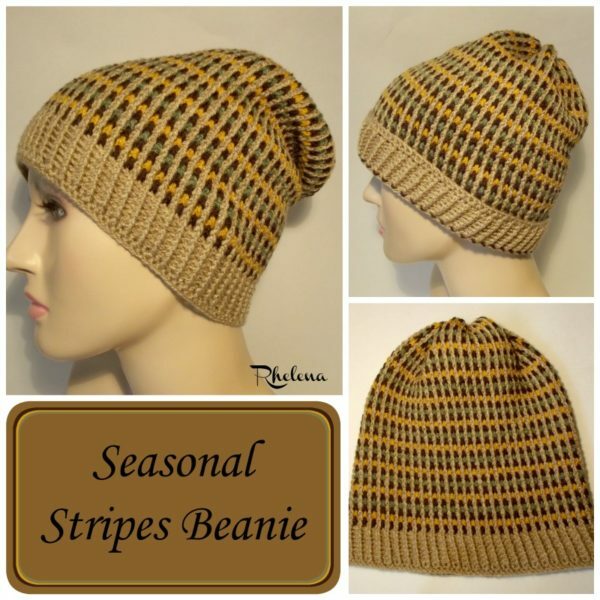 The hat is worked using four fall colors, but any four colors will look just as lovely. Fall is almost over, but I can see it rockin’ in Christmas colors! This hat is crocheted in post stitches, which results in a nice thick fabric. Hence, I chose to use a fine yarn. However, it can also be worked in a worsted weight if you like. The main thing is to keep the gauge the same over the rounds. And you’ll also want to use large enough hooks to keep the fabric flexible. I recommend a soft worsted yarn like Caron Simply Soft and an I and a K crochet hook. A tip from Fran, one of my testers, is to use a steamer to help soften the worsted fabric. Just be careful though that you don’t kill the yarn as some yarns are easily destroyed with heat. The most difficult part about crocheting this hat is to keep the yarn from tangling. Aside from that it’s a fairly easy and mindless pattern once you get going. And if you enjoyed this, perhaps you’ll also enjoy more designs in the Seasonal Stripes Collection. colors: Tan, Chocolate, Sage and Golden Yellow. Gauge: 2″ across 12 sts throughout pattern. fit any size. Measures 9.5″ high by 9″ wide when lying flat. 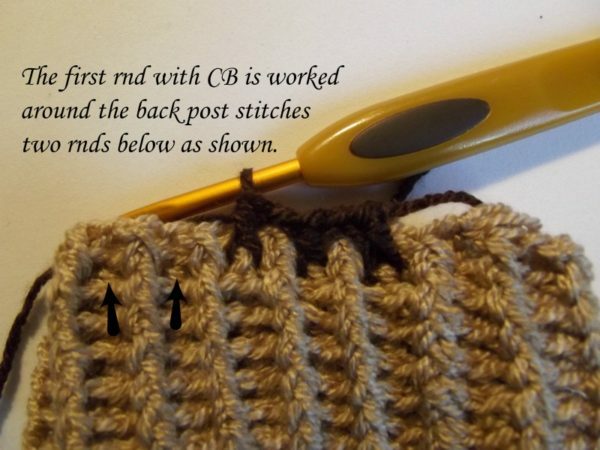 Stfphdc = Standing Front Post Half Double Crochet – Refer to this tutorial. CA is always worked on top of CA. It is never joined to the other colors, or worked on top of other colors. It has it’s own rounds so to speak, and is worked every other round after rnd 10. CB is joined with a Standing Crochet stitch to the 2nd st of rnd 11. CB, CC, and CD are joined to each other at color changes, but never to CA. Yarn is carried up at each rnd. Please refer to this tutorial on how to work the stitch pattern, change to the new color and carry the yarn. To avoid a mess of the yarn, rearrange the yarn after each rnd. Rnd 1: With CA and 3.00mm hook, fsc 110 (or any multiple of 2); join with sl st in first fsc being careful not to twist sts. Rnds 4-9: Same as rnd 3. Rnd 10: With 4.00mm hook, Ch 1, (fphdc, ch 1) in same fphdc as join and into each fphdc around. (do not crochet into the bphdc’s) (55 fphdc) Pull the Loop Long and Drop CA. Image to help with Rnd 11. Rnd 12: With CA, *Working in front of previous rnd and into 2 rnds below, ch 1, (fphdc, ch 1) into first fphdc and into each fphdc 2 rnds below. Join with sl st in first fphdc*. Pull the loop long and drop CA. Rnd 13: Join CC to CB and Rep rnd 12 from * to * with CC. Pull the loop long and drop CC. Rnd 14: With CA rep rnd 12. Rnd 15: Join CB to CC and rep rnd 12 from * to * with CB. Pull the loop long and drop CB. Rnd 16: With CA rep rnd 12. Rnd 17: Join CD to CB and rep rnd 12 from * to * with CD. Pull the loop long and drop CD. Rnd 18: With CA rep rnd 12. Rnd 19: Join CB to CD and rep rnd 12 from * to * with CB. Pull the loop long and drop CB. Rnds 20-80: Rep rnds 12 to 19 until you have reached a desired height. I ended mine at rnd 16 for a total of 80 rnds. Fasten Off all yarn leaving a long enough tail for weaving in. At last rnd leave a 10″ tail for weaving in through the last round and closing up the hole. I wove mine in through the dc sts, but you wouldn’t have to go that close. Note: Weave in all other ends before closing the hat. Pull tail end tight and weave in the end to secure. 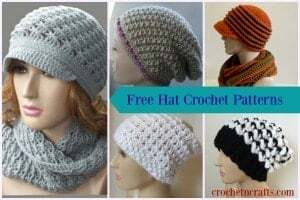 Oh and did you know that CPB has over 330 FREE Crochet Hat Patterns for women? Check it out as I’m sure you’ll find some great patterns to add to your personal collection.